By Benjamin M. Kacos, D.M.D. Aging brings wisdom, perspective on life, and an amazing sense of self. The not-so-fun side of aging is that it can create some unwanted health concerns. As we get older, the normal functioning of the body can be compromised. Some of it is hereditary, some self-induced due to lifestyle; nonetheless, we are all bound to feel the effects of aging. One of the first things to go as early as your 30s is the metabolism. It slows down and reduces the ability of the body to utilize nutrients, causing your metabolism to become less efficient. This is the very reason why it’s crucial for people in their golden years to be very deliberate with observing healthy practices; otherwise, their quality of life can easily go south. So what does all of this have to do with oral health care? When I first began practicing dentistry, one of the things that fascinated me the most was the connection between the mouth and body. I became extremely passionate about educating seniors about their overall well-being and the connection to their oral health, so much so that I have made it a priority to visit local senior communities regularly to give talks on the mouth and body connection. Poor oral health is associated with many of the health complications as we climb the age ladder. Diabetes, cardiovascular disease and even certain cancers are all connected to our oral health. So much of the issues we see are preventable, and I love educating on this subject. When setting goals around a healthy body in your golden years, it is so important to include oral health care in your daily routine. This will help you to preserve a high quality of life even as you continue to advance in age. Web MD has a great article about the mouth and body connection in which they explain how our mouth is the gateway to our body. “The immune system moves in to attack the infection, and the gums become inflamed. The inflammation continues unless the infection is brought under control. Visit your dentist regularly. This should actually be more frequently than when you were younger. 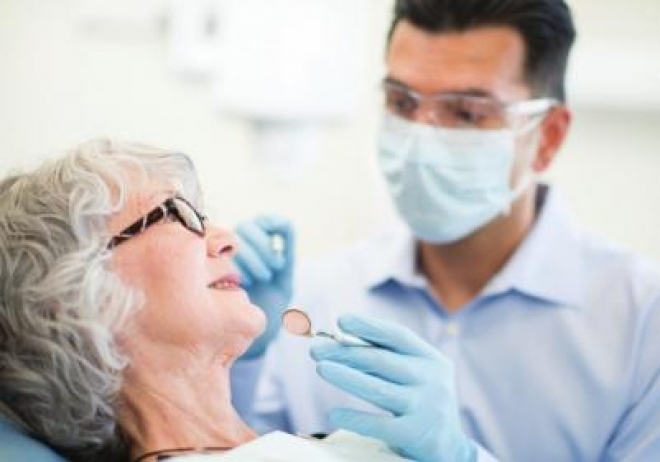 Getting older makes your mouth more prone to periodontal disease, and visiting your dentist regularly can help keep this serious oral health disease at bay. We find that so many of our patients who take medication have the side effect of dry mouth; this can speed up the periodontal disease growth. If you are experiencing bleeding or inflammation in your gums, please see your dentist to get ahead of the problem before it turns into something worse. Even if you’re wearing dentures, brush twice a day. This will maintain the proper pH balance of the mouth and prevent bad breath. Floss like a boss! I had a patient tell me the other day he only flosses when he comes to the dentist. Believe it or not, that is pretty common. If you can get into the habit of flossing daily, you are doing the work to prevent plaque build-up, which is so important for the longevity of your teeth. If regular nylon floss hurts your gums, consider a Waterpik or even kids’ floss. We don’t always feel when we have food lodged between our teeth and gums, so flossing is a high priority. One more tip: Avoid overeating bread. A bread-heavy diet often results in the fast development of plaque and tartar that can also lead to periodontal disease. Please, please, please, stop smoking. If you haven’t yet, it is never too late to stop. Not only does smoking create the ideal environment for the mouth to develop periodontitis, otherwise known as gum disease, but it can also increase the risk of mouth and throat cancer. Addiction is tough to break, and it takes a considerable look in the mirror, but I promise, the perseverance is worth it! Drink more water, especially if you have dry mouth. As I mentioned before, dry mouth is very common in seniors or in adults who take any kind of blood pressure medication. If you’re taking medication that has dry mouth as a side effect, consider asking your doctor if there’s an alternative that doesn’t cause dry mouth. If that is not an option, chewing sugarfree gum is a great way to help prevent dry mouth. Chewing gum will stimulate the salivary gland, and, at the same time, it can help dislodge food debris stuck around your mouth. Using an antibacterial mouthwash after brushing and flossing to further prevent plaque build-up also goes a long way. Listerine recently launched alcohol-free and natural mouthwash options, which I like. Tom’s is another good natural brand. Finally, I like to recommend the switch to a vitamin-rich diet to boost your immune system and prevent bacteria from quickly proliferating in your mouth, as well as strengthen gums and teeth, which is a topic that could really be its own article. There has been so much development in the last decade around diet and oral health, that we should be very much in charge of our own health by the things we decide to put in our bodies. If you have concerns about your oral health or the oral health of a loved one, consult your doctor and dentist. Prevention is the key to a long, healthy life! Benjamin M. Kacos, D.M.D., offices are located at Shreveport’s Dentist, 230 Carroll Street, Suite 3. He specializes in root canals, dental implants, dental crowns and bridges, and more. He may be reached at 318-869-2593.